At Stock Informer we provide up to the minute stock alerts for the Lots-O-Huggin Bear. Our servers track both online stock and High Street Shops and provide a free email and text messaging service for Lotso Huggin Bear. Friday 26 Apr - Latest - No new stock to report. Lots-o-Huggin Bear is the leader of the toys at the Daycare centre in Toy Story 3 and now comes as a soft pink interactive teddy bear. 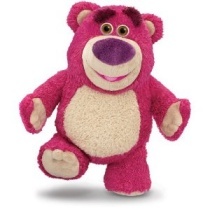 Suitable for children ages 4 years plus, Lotso Huggin Bear is a great replica of the on screen film character. Just like in the movie, tickle Lotso's foot to make him laugh, lay him down and his eyes will close and squeeze his hands to hear cute interactive phrases (over 45 in total). 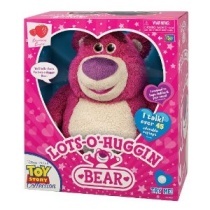 Lotso Huggin Bear will also respond to the volume and tone of your voice. As in the film, Lotso Hugging Bear smells of strawberry and has posable velcro legs and arms for easy hugging! 2 x AA basic batteries are included, however it is recommended further higher quality batteries are purchased to ensure Lotso doesn't disappoint on Christmas day. Lotso measures over 30cm tall and comes with special edition packaging and certificate of authenticity to hang on your wall! Lotso Huggin Bear is the must have gift for Christmas 2010 is already proving incredibly popular with stock shortages in the UK. Here at Stock Informer we try and help you avoid tears come Christmas day and relieve you of the stress of trying to find Lotso Higgin Bear stock. We do all the leg work for you by constantly checking online retailers for stock and immediately inform you when stock is found either directly on the website, by email or text message. We also track selected high street stores in your area for stock ensuring you have the best chance of bagging Lotso Huggin Bear before stock runs out.